Imagine being able to release a chemical that makes a house grow around you. There are critters that can do this. Insects, mostly. 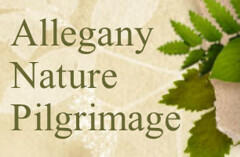 In winter, when the foliage has fallen away from the plants, you can find plenty of evidence. The “houses” they create are called a galls. It seems the larvae of gall-producing insects release powerful growth hormones that cause plants to grow in unsual ways… creating perfect shelters for themselves. Each gall-producing species has a preferred host, so when you find the “house” you can also know the insect that produced it. 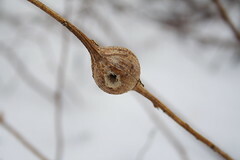 The Goldenrod Ball Gall is produced by a fly larva (Eurosta solidaginis). Read more about it by clicking here. 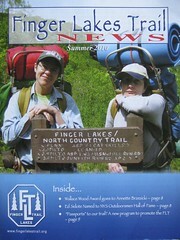 I also wrote about it last March. You can read that post here. I think the fun thing to notice about Ball Galls in winter is the shape of the hole – if any… No hole means the larva is still inside. 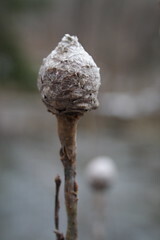 A pinhole means this is a 2-year-old gall and the adult escaped last spring to lay more eggs. Larger holes usually mean bird activity; birds know there’s a tasty snack inside! 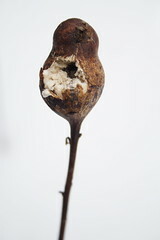 The picture above shows a gall that was visited by a downy woodpecker. With that long pointy beak, a downy can get right to business finding the larva inside. This gall was visited by a chickadee… Shorter beak and much less precision in finding the snack! The Willow Pine Cone Gall is another fairly conspicuous gall that you might find on a winter walk in the Great Lakes region. This one is caused by a tiny midge (Rhabdophaga strobiloides). The adult lays eggs at the branch tips. The larva burrows in and the gall is formed right at the end of the twig. 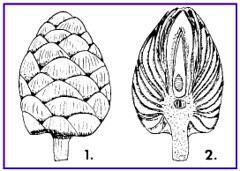 It so resembles a pine cone – the seed forming part of conifers – that many people mistake it for the seed-producing part of this plant. Nope! It’s an insect house. It’s all too fascinating… Nature never ceases to amaze me. 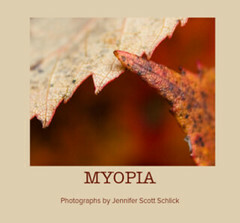 This entry was posted in birds, galls, insects, winter. Bookmark the permalink. Oh,forgot to add — thanks for the links! This is wonderful and I love finding the many different galls that are out there! I have a slide here somewhere of a Downy with a goldenrod gall! I only started to notice galls this year … then I saw them everywhere … many different kinds. We even had a couple of those willow galls in our very own yard! 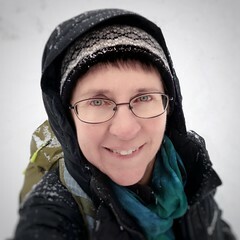 Awesome Blog girl!! Keep up the great work!! : ) You’re doing a great thing.. The Stokes guide is incredible. I didn’t know about galls until I read the guide and have been noticing them ever since. I like the idea of a gall hike with kids, what a great way to get them paying attention to the what is around them unnoticed. Neat! I like those galls. 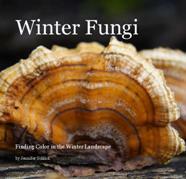 I’d not heard of the “Nature in Winter” guide–what a helpful tip to pass on! Wow, that is amazing! I never knew! What species of willow are impacted? I’m afraid I do not know the answer to that question!